Wow! What a way to travel. 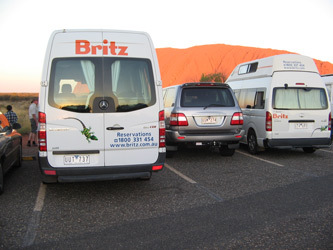 We picked up the Britz Elite in Alice Springs. 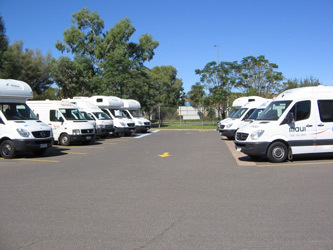 This was the vehicle of our choice as our intention was to use the Free Stays and we were aware that at some of the locations there would be limited facilities, ie showers. The depot had people coming and going however I found the staff to be very helpful. At the time of pick up we were shown the DVD touching on all the features of the campervan which was very useful and informative. Also I found out that you could pre-register your details including drivers licence, contact details and other personal information which would save you time. Our first stop was to the grocery store for supplies. Thanks to the depot for supplying maps to point us in the right direction. With the camper full of fuel and the fridge full of food and liquid refreshments, we were happy to stay in the BIG4 MacDonnell Range Holiday Park for a couple of nights. The first sight-seeing day that we had was a public holiday for Anzac Day and the town was very busy with parades and the like so it was better for us to see the out-of-town attractions. We had an early night and a lovely pancake breakfast the next morning supplied by the Caravan Park. I first heard about the free pancake breakfast on Sunday's when I was in Alice Springs about 17 years ago. It was the perfect time to socialise with other tourists. The funny thing was, some of the people that attended the pancake breakfast were in fact locals. They had driven into the town from the outskirts and stayed at the park for their children to play in the playground and swim in the pool to cool off! It was an early start Monday morning for the Balloon flight. We were picked up at 5.30am and taken out past the Airport to help set up the balloon and basket. It was all very exciting. In total, there were 18 passengers plus the Flight Engineer. We departed just before daylight and the sunrise was sensational. We remembered to organise a late departure with the kiosk at the caravan park the night before because we would be returning late in the morning. As we floated along it was interesting to see a huge jet take off from the Alice Springs airport and head towards us. The plane got out of our way because it had a steering wheel! It was our intention to see the red centre as 'red' but due to the unusual high amount of rain during the summer months it was very green, but beautiful all the same. We were delivered back to the caravan park after the champagne breakfast, which was all part of the tour. 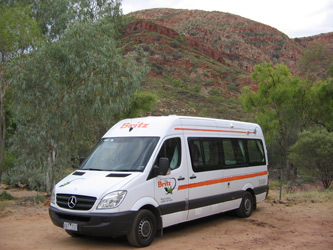 The next part of our adventure was a short drive out of Alice Springs visiting the West MacDonnell Ranges. This is an area I had previously visited but was still just as fantastic due to the amount of water in the creeks and everything was green instead of dry and dusty. The Ormiston Gorge Campsite has showers and toilets but I was pleased to have our own onboard during the night. The shower in the morning was very refreshing to start the new day. Today's adventure meant heading back into Alice Springs and making our way south. Kings Canyon was on my bucket list to revisit and was just as spectacular as the first trip. The last journey we walked right up to the end of the gorge but this time we were limited on how far we could walk. The Campervan travelled like a charm. The speed limit in Northern Territory on the open highway is 130km per hour but we found travelling around 120km per hour was quite comfortable with good fuel economy. 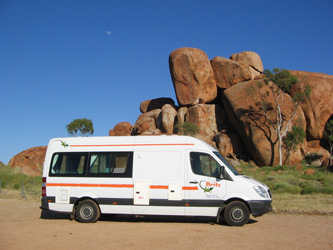 At Curtin Springs (85kms east of the entrance to Ayers Rock) there is a campsite and you will meet Peter, the owner. At 83 years old he is as sharp as a tack. There is a fascinating sign over the door, 'We are happy you have visited us - for some happy when you arrive and others happy when you go'. I am confident he meets some really interesting characters. It's now time to head off to the 'Big Rock'. Regardless of what anyone wishes to call it, my school books refer to it as Ayers Rock. Peter from Curtain Springs has some interesting facts about the area. He actually built the first gateway to the National Park. We were happy to pay our AUD$25 each for the 3 day National Park pass to see such a beautiful sunset. When the sun went down the moon came up over The Rock. I think this was a moment never to be forgotten and possibly not seen by many that visit. After a relaxing night at Yulara Campgrounds we spent the next day viewing Ayers Rock. I had climbed 'The Rock' previously about 17 years ago but remembered my legs as they shook just looking at it. No! No! they pleaded with me to take the easy drive around on the main road. There are many places to stop off to take photos (remembering to take note of any signage saying 'Sacred Site' where photos are not permitted to respect the wishes of the Anangu people). The Cultural Centre is worth a visit showing natural artefacts from the area and the chance to see some Aboriginal Paintings or souvenirs. I found these to be very expensive and perhaps it may have been cheaper to purchase your souvenirs from Alice Springs. About half an hour's drive from The Rock is The Olgas, which I can now happily remove from my bucket list. While not as famous as Ayers Rock, The Olgas are just as dramatic but in a very different way. There is a viewing platform (which I recommend) just before you reach the car park to The Olgas as you are able to see the great rock formation in front of you, and to the right, Ayers Rock in the distance. After seeing this wonderful outback region again it was time to backtrack a little on our way north towards Darwin. Our northern journey into the Barkley Tablelands was a pleasant drive and was no trouble for the camper. We were awestruck by the vastness of the area which continued until we arrived at Mataranka. A quick dip at the Mataranka hot springs is a must. There is plenty of history in this area and is famous for the book, 'We of the Never Never'. The book is an autobiographical novel by Jeannie Gunn and accounts for her experiences in 1902 at Elsey Station. Mrs Gunn was the first white woman to settle in the area. A visit to the Elsey Graves was very interesting. 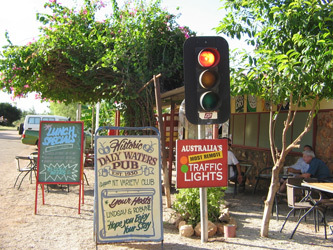 Proceeding onto Daly Waters and taking a detour off the main highway to the local pub is worth a look. A trip up to Katherine Gorge is also very exciting and I would love to fly over this area and Kakadu while it's in flood. I will have to add this to my bucket list. While time did not allow us to travel to Kakadu and Litchfield National Parks, these are areas I had been to on previous occasions. A grandson in Darwin was awaiting so I was anxious to spend a few days with the family before the end of our holiday. The vastness of Australia must amaze international visitors. If you are looking to travel in this beautiful country please ensure you give yourself adequate time to travel the distances between attractions. You may find that it is further than what you think. To give you a mental picture of the area, you can fit the United Kingdom (England, Northern Ireland, Scotland and Wales) into the Northern Territory almost 3 times over. We thoroughly enjoyed the camper and being able to stop for a photo or have a cuppa at any time. The camper is fitted out with all the comforts of home. The pots, pans, cutlery and crockery were clean and well presented. The extra knives and kitchen utensils were plastic wrapped and we were pleased with the extra serving dishes and containers complete with lids for storage. These were the little things you cannot carry with you in your suitcase and pleasing to know that they have been thought of. The walk through access from the front driving area to the back living area was a bonus when we were making an early morning start. We kept a close eye on the fuel consumption and was more than happy with the result. If you are travelling long distances at higher speeds the fuel consumption was not as good, however, if you were prepared to pay a little more for fuel and save by utilising the Free Stays it probably all works out in the end. There was ample storage space for hanging clothes in the cupboard. Ensure you take advantage of the empty space under the bed by taking soft bags (instead of rigid suitcases) to enable easier storage. For the most part, we had no need to set up the table and chairs inside the camper. We much preferred to sit outside in the natural environment. At night especially, due to the millions of stars overhead. It was truly breath-taking.